Carpet Cleaning Carpets are some of the most used items in your home or commercial space. They are constantly being stepped on, grime from your shoes gets embedded in them, and ultimately they become a cesspool of germs. It is important to have your carpet cleaned every so often, and more important to get it done by a professional carpet cleaning service. A professional carpet cleaning service by a qualified handyman in your area like Bobby’s Tampa Handyman Service can make all the difference in making your old carpet look like a million bucks by restoring its color and texture. If you have children or pets, your carpet probably has tons of dander, muck, mud, grime, or stains on it. A clean carpet is easier to maintain on a daily basis that a filthy one. A dirty carpet can harbor tons of microscopic bacteria and germs that you may not be able to see, but is responsible for making you and your spouse and children sick and if not sick, certainly putting them at risk of becoming sick. Carpet cleaning also eliminates stubborn stains that slowly set in over time and become difficult for you to remove yourself. 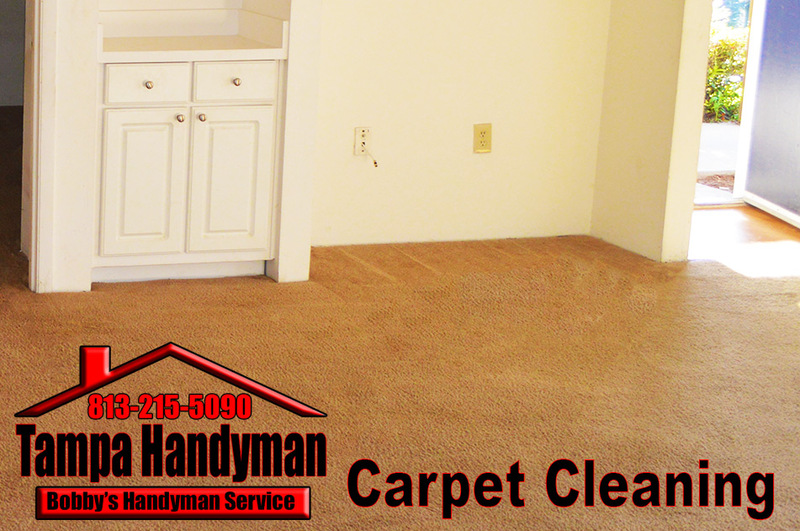 So call Bobby’s Tampa Handyman Service today to take care of all your carpet cleaning needs!